I’m still working on the upholstery. I really want to go fast and finish. I also really want to go slow and have zero mistakes. What a conundrum! The mistakes that I have made so far have caused me to go the slow route from here on. In the last article I described getting the rear cargo and 2+2 seats done. Onward to other items. 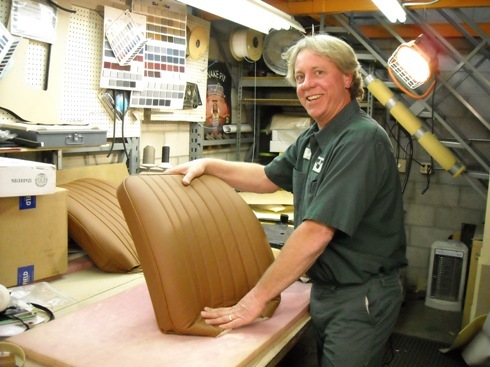 Getting the driver and passenger seats upholstered was easy. Discretion was the better part of valor, that, and being in California for almost a year led me to sub out the seats to XK’s Unlimited in San Luis Obispo, CA. They did a very nice job, as I knew they would. The seats have been back in New Hill sitting in the garage attic. I found the seat tracks in my parts pile. I hate seat tracks that don’t work so I spent quite a bit of time cleaning out all of the old gunk in the slider mechanism and getting them to operate smoothly. At some point, new paint was applied. 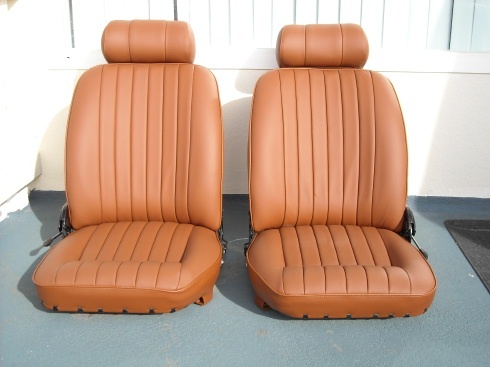 These seats are out of a Series 3 car which caused the floor mounting points for the tracks to be a little different. Fortunately I had test fit the tracks back when I was doing body work and had cut and relocated the mounting points. The tracks fit up very well in their new positions. Attaching the tracks to the seats was a matter of 4 bolts. I did have to puzzle a while over the recliner mechanism. After intense study of my photos I got it figured out. Installing the seats made a big difference in the look of the interior! Next I got to work on the “cantrails”. Funny word, I’m sure someone knows its origin. 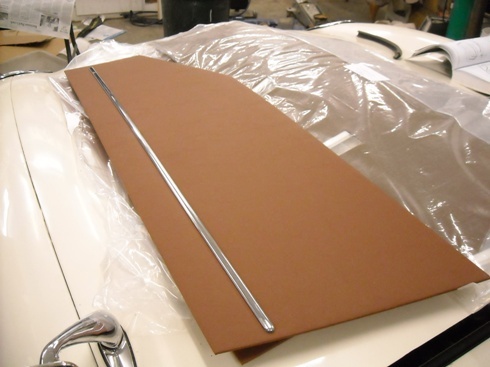 I think of them as “crash rails” as they are padded and will absorb some small amount of impact from your head on the door frame in the event of a side impact crash. Not quite like side mounted air bags but every little bit helps. These strips basically follow the contour of the front and rear windows. Several tips on this job were learned by moi. First, the cantrails are held in by screws or rivets that insert from the outside inward, under the rubber door and vent window seals. It broke my heart to have to remove these seals, as the door seal was quite a beast to install originally. But it had to be done so off came the seals. Be sure and test fit the cantrails, including pre-drilling of the attachment holes, and starting all the sheet metal screws. You don’t want to be drilling any holes later after the new vinyl is applied, as the drill bit is at great risk of popping through the vinyl. Ask me how I know! Another tip: There is a chrome strip on the edge of the cantrail. Buff this strip while it is still mounted to the old vinyl. In its mounted position, if can be aggressively buffed without fear of bending the fragile strip. Then carefully remove the strip and store it to re-apply after you put on the new vinyl. Installing the new vinyl: Straight forward on the straight sections. Hard to get wrinkle free on the curves segments. Be prepared to really pull on the outer radius to get it stretched. Then re-apply the chrome strip and you are ready to re-install the pieces. Sounds simple but I probably spent 3 to 4 days on these pieces alone. 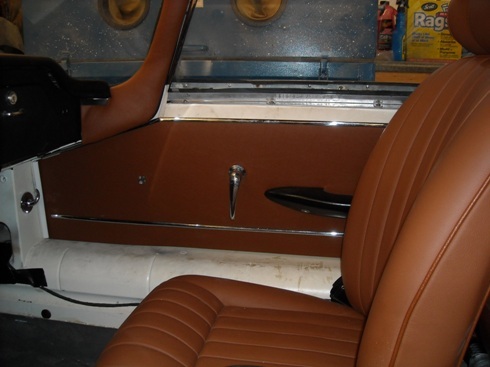 The reward is they hide the rough edges underneath and really clean up the look of this part of the interior. After you are done with the cantrails, you can put your door and window seals back in. This can be hard tedious work. Once done, you have a last chance to check the fit on the doors at their closing faces. The door hinges connect to the face of the door and to the face of the door opening, with these 2 surfaces being at right angles to each other. Loosen the bolts on the door face to raise the rear of the door vertically until it is right. Loosen the bolts on the face of the door opening to move the door in and out and also to “twist” the door. It takes a lot of trial and error to get everything right. The new seals will probably fight you too, as they are new and stiff. 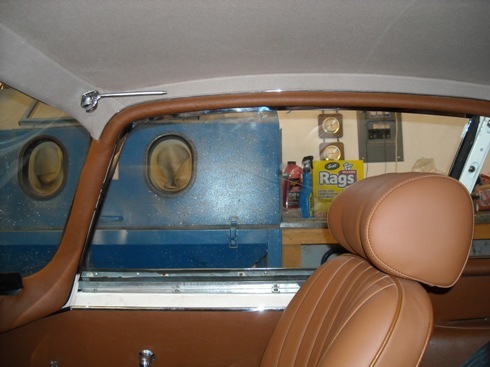 Keep after it and you will be rewarded with a much improved door fitment. Once the doors are “right”, you can install the door panels. My panels came pre-cut from BAS. I did have to transfer the chrome accent strip from the old door to the new door. This strip also got a good buff and polish. 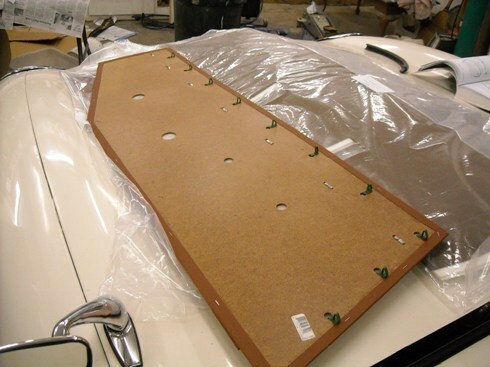 The door panels are held in with metal clips on the back side. There is also a chrome strip across the top of the panel that holds it in at the top. This is a 2 part strip and is also transferred from the old door. It will also need a good buff and polish. The door panel is placed just below the chrome strip and then pushed upward into the strip, which captures the panel along its top edge. Then the metal clips can be pushed firmly until they engage their mounting holes. Finally, I installed the “grab handles” as they also serve to hold the panel in place. 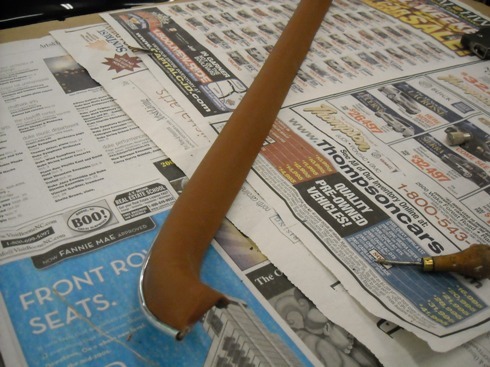 I discovered that my grab handles are black and look like they will be a beast to upholster in brown vinyl to match the rest of the car. I am looking into dye as an option but will leave them black for now. Installation of the interior door and window winder handles finished off the job for now.